Can Christians be "atheistic?" Yes, that seems like a contradiction in terms and, No, I have't been smoking something funny! So what am I getting at? Let me explain. The most devout among us become atheistic in this connection; we do not believe God, we enthrone common sense and tack the name of God on to it. We do lean on our own understanding, instead of trusting God with all our hearts. I really like that. I think he is right on! 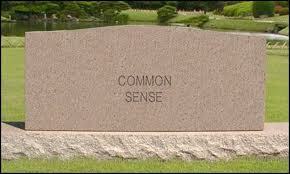 "Common sense" does seem to have become a god in our society. If what "common sense" dictates seems to go contrary to what God has clearly said in the Bible, "common sense" does often seem to win the day - even among Christians. Chambers quoted Proverbs 3:5, "Trust in the Lord with all your heart, and do not lean on your own understanding." This is something that the atheist obviously cannot do. He cannot trust in a Lord that he does not believe in. Likewise, "common sense" also does not trust in the Lord. "Common sense," like the atheist, does lean on its own understanding. Jesus said, "do not be anxious about your life, what you will eat or what you will drink, nor about your body, what you will put on..." (Matthew 6:25ff). In our society, "common sense" dictates otherwise. We are told to prepare for tomorrow, to build nest eggs for rainy days, to save for retirement. When we haven't done that, or are unable to, we do become anxious and we do tend to worry. In other words, we do tend to lean on our own understanding. And if we do tend to lean on our own understanding, then (according to Proverbs 3:5) we are also not really trusting in the Lord. Furthermore, if that is true, isn't that then also atheistic in nature? Should a Christian rely on "common sense?" Can a Christian be atheistic? Can you share some examples of how this might be true? Reading between the lines of my friend’s comment raised a couple more questions. Why is it that we do not always say what we’re thinking? The short answer is that it is not always “politically correct” to do so. Was I being “politically incorrect” in saying what I said on Twitter? In my books probably not, since I didn’t directly express a personal view either for or against “gay clergy.” In the view of others, maybe I was. You can read between the lines and draw your own conclusions. Truth be known, I hate the concept of Political Correctness. I believe that in many ways it is simply a left-wing liberal idea, much like Ecumenism, whereby we reduce society to the lowest common denominator in an effort to promote some form of pseudo-peace and pseudo-unity. Everyone gets reduced to the same miserable level to such an extent that no one knows how to think for themselves anymore. Heaven forbid that anyone say something against the new status quo! If you do, well they label you as being not very “politically correct!” Forget “Freedom of the Press!” The whole thing is nothing more than an accepted form of censorship whereby society dictates what you and I can and cannot say. Now as a caveat, I’m not a racist and I do not go out of my way to hurt or offend anyone. I’ve sometimes joked about it by saying, “I hate everyone equally,” but the truth of the matter is that this is no joking matter. Mark my words, if we continue on this course of this “politically correct” nonsense, it will only be a matter of time before this left-wing liberal agenda makes the Bible itself “politically incorrect” and it becomes classified as hate literature. Think I’m kidding? I wish I were. As an example, let’s go back to where we started this discussion. It came about as a result of a comment I made about the pro-gay clergy discussions on Twitter. Now I’m going to quote the Bible and in so doing, I will no doubt be “politically incorrect.” Here goes: Paul said, “Do you not know that the unrighteous will not inherit the kingdom of God? Do not be deceived: neither the sexually immoral, nor idolaters, nor adulterers, nor men who practice homosexuality…” (1 Corinthians 6:9; ESV). Now what do you suppose the left-wing liberal agenda will do with that? Though I’m sure that those who were offended by that statement from the Apostle Paul will not understand this, this was NOT a word of hatred towards them or the gay community. I know like you do that God loves them too. However, that fact does not mean that God agrees with the practice of homosexuality. This is NOT hate literature. In God’s mind, there are certain things that will prevent us from inheriting the kingdom of God, and homosexuality is one of them. It is no different than if my son or daughter would do something contrary to my wishes. If they did, does that mean that I suddenly would stop loving them? Of course not! They may not inherit my blessing on their disobedient actions, but I would still love them. If I have a problem with anything, it is trying to understand how people who call themselves Christians can at the same time accept the gay agenda, even to the extent of permitting that sin (oops, I went and used that politically incorrect “sin” word again) in the clergy ranks. That is where my trouble understanding lies. Then again, when we stop and realize that advocates of gay clergy are usually also from the more left-wing liberal churches, this really shouldn’t surprise us when they also follow the “politically correct” path in order to not offend. It is in my way of thinking absurd to think that a person can be “politically correct” and be a Bible-believing Christian at the same time. Does that offend you? If so then perhaps once again I wasn’t being very “politically correct.” I believe that the bottom line is that those who worry about “political correctness” are also more likely to worry about what others think of them. However, who should we be concerned about pleasing; man or God? Usually that’s an either /or proposition. We cannot have it both ways. Galatians 1:10 says, “For am I now seeking the approval of Man, or of God? Or am I trying to please man? If I were still trying to please man, I would not be a servant of Christ." The best way to be a servant of Christ is to follow God’s word and to be in agreement with His worldview, even if that means being “politically incorrect” because we speak against man’s worldview. In desiring to be “politically correct” in order to not offend man, is it possible that we may have actually offended God instead? As Christians, what ought our approach to “political correctness” be? Where do we draw the line? I wonder. I was reading of how Elijah once asked the people of his day, “How long will you waiver between two opinions? If the Lord is God, follow him; but if Baal is God, follow him” (1 Kings 18:21). As I thought about that verse, I wondered if we too in the church today tend to waiver between two opinions. I’m not suggesting that we have Baal worshippers today as in Elijah’s day, but we do have things that compete for our devotion to the Lord God, and perhaps those competing things are also just as vile in God’s sight as if it were Baal himself that captured our interest. Let us fast-forward now a few millennia to our day and age. The deity Baal is now gone; or should I say, in name he is gone. 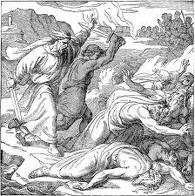 The spirit of Baal, however, continues as in Elijah’s day. How? I would like to suggest that it does so through modern idolatry. Just as Baal worship led people away from the worship of the Lord God, so too does idolatry today lead people away from worshipping the Lord God. The idolatry of self-interest and the idolatry of money, to mention but a couple, are alive and well today. Taken the wrong way, even pledging allegiance to a flag or other national symbol can be a form of idolatry. Sports fanaticism taken to the extreme can be a form of idolatry. Some of our idolatries we don’t even hide anymore in that we blatantly even call them “idols;” such as the popular “American Idol,” or its Canadian counterpart, “Canadian Idol.” Now, I can almost hear the objections to that already. People will say, “We don’t worship those aspiring stars!” Based upon what little I’ve seen of it, not to mention the very name “idol,” I would argue that there is an element of worship there. It’s more than just semantics. Still don’t believe me? Here’s the test of it. Do they give as much glory and honor and love to the Lord God as they do to their “idols?” Do they give as much time and effort to studying the Bible as they do studying their idols? Do they give as much time calling on the Lord God in prayer as they do calling the 1-800 phone number to vote for their favorite Baal, I mean, idol? Sorry, but I doubt it! Therefore, it’s idolatry, pure and simple. There might as well be a statue to Baal right there on the stage as well (ouch!). Now if I haven’t already offended everyone, please bear with me a little longer. I do not tend to be legalistic, nor am I am suggesting for a second that Christians cannot take an interest in TV programs, such as sporting events and “American Idol.” Certainly not! I’ve simply and deliberately gone to the other extreme to illustrate a point. The name “idol” aside, the question is simply one of, do we today also tend to waiver between two opinions? Do we tend to waiver between the opinion of God and the opinion of the world? In terms of priority, where does our walk with Jesus fall on our activity interest list? How serious do we take God’s word? Paul contrasts the acts of the sinful nature with the fruit of the Spirit in Galatians 5:19-23. He says, “The acts of the sinful nature are obvious: sexual immorality, impurity and debauchery, idolatry and witchcraft; hatred, discord, jealousy, fits of rage, selfish ambition, dissensions, factions and envy; drunkenness, orgies and the like. I warn you as I did before that those who live like this will not inherit the kingdom of God. But the fruit of the Spirit is love, joy, peace, patience, kindness, goodness, faithfulness, gentleness and self-control. Against such things there is no law.” Now here’s the question: where on this list do we see ourselves? Let’s be honest. To a point, we might be able to fool each other, but we cannot fool God. Likewise, when God’s word tells us to, “make every effort to live in peace with all men and to be holy” (Hebrews 12:14), do we listen and do we obey? Or do we look just like the world in that we’ve also adopted a lethargic non-peaceful and non-holy mentality? Contrary to what some people will tell us, we cannot have it both ways. Joshua understood this when he said, “Now fear the Lord and serve Him with all faithfulness. Throw away the gods your forefathers worshiped beyond the River and in Egypt, and serve the Lord. But if serving the Lord seems undesirable to you, then choose for yourself this day whom you will serve…But as for me and my household, we will serve the Lord” (Joshua 24:14-15). It’s about choices; it’s about choosing A or B, not A and B. It’s one or the other. The only question that remains is, what is my choice going to be? Much to our discredit, I believe that the modern church has somehow forgotten that God is a jealous God. He said in the Ten Commandments, “You shall not make for yourself an idol in the form of anything in heaven above or in the earth beneath or in the waters below. You shall not bow down to them or worship them; for I, the Lord your God, am a jealous God” (Exodus 20:4-5). Some say, yes, but that’s the Old Testament. Very good, but has God’s nature changed somewhere between the Old and the New Testaments? Of course not! If that were true, then we had better tear out the Old Testament portion of our Bibles and throw them away. God’s nature does not change. “Jesus Christ is the same yesterday today and forever” (Hebrews 13:8). What or who is the ‘master’ or ‘possessor’ of our souls? Is it some modern form of Baal? Or is it the Lord God alone? Have we Christians become indistinguishable from the rest of the non-believing world? Based upon our nature and demeanor alone, (and without the aid of carrying Bibles and placing bumper stickers on our cars), does the world even know we are Christians? As the old saying went, “if Christianity were illegal, would there be enough evidence to convict you of being a Christian?” Or do we look just like the world? How long will we waiver between two opinions? God help us. I was thinking about how we often use words in ways contrary to their actual or original meanings. Some would say that language evolves, and to a point, that may be true. For example, the word “gay” used to mean happy. However, it is rarely used in that fashion today! Likewise the word “church” used to mean the “Body of Christ,” and while that’s still partly true, apparently it means more now too, as evidenced by a “Buddhist Church” sign I saw recently. Yet another example of how we use words differently today stems from my use of the nickname “Preacher” on a couple online biker sites that I visit from time to time. When asked about that nickname, I tell people that it reminds me of a time when I was a pastor, or a “Preacher.” But what does that mean? Well, the way I used that word back in those days, is vastly different than I use that word "preacher" today. I would like to focus on “preaching” on this post today. Lets look at that word “Preach.” According to my dictionary, “preach” is defined as follows: 1, speak publicly on a religious subject; 2, deliver (a sermon); 3, make known by preaching; proclaim: to preach the Gospel; 4, advise or recommend strongly; urge. In true Christian communities, probably the most accepted and understood definition of “preach” has to do with proclaiming the Gospel. So far, I’m sure we have no disagreement here. A preacher is one who focuses his energies on preaching the Gospel message. However, it is at this very point that it all begins to get a little grey for me, and it is also at this point where we will probably also begin to see some disagreement among believers. A quick caveat before I go any further: I mean no offense, and if this does offend you, I beg your forgiveness. If a preacher in a church setting preaches anything other than the Gospel, is he still a preacher? Is it not true that the only proper theme of preaching is Jesus? If so, then anything other than preaching Jesus is essentially a false gospel, and in the truest sense, is not Christian preaching at all (see: Galatians 1: 6-10). I remember sitting on a pew once and hearing a sermon about the attributes of Harry Potter. Was that preaching? Not in my books it wasn’t! Then what was it? To this day, I haven’t a clue. Everything seemed to be there, everything that is except for Jesus. Likewise, if those in the pews are all already Christians, do they need to have the Gospel preached to them yet again and again? If so, is that not like implying that they lose their salvation during the week and have to come again Sunday after Sunday to be re-saved? Sounds ridiculous, doesn’t it? Of course that’s not why people go to church Sunday after Sunday! Having said that, then can we say that what the pastor does from behind his pulpit cannot rightly be called “preaching,” since it is assumed that his congregation is already saved? Some would argue that there could be non-Christians in church that day, so he has to preach. Yes, I would agree with that, but probably not in the same way as those who use such arguments would mean it. Churches are full of religious people, but that’s not to say they are necessarily full of true Christians. The very vast majority of self proclaimed agnostics and atheists, the very ones who need to have the Gospel preached to them, are never (or almost never) found in church buildings. Church buildings, and the events therein, are irrelevant to most non-believers. (Ironically they’ve also become irrelevant to many true Christians as well, as evidenced by the growing number of true Christians outside of the institutional church today). For institutional church leaders to expect to reach the lost in their buildings seems a little naïve to me. If we want to reach the lost, and be able to preach the Gospel to the lost, then doesn’t it make sense to go where the lost are? Some would say (in error), “well the pastor can’t be everywhere, so he must focus his ministry in one location.” I would argue, since when was preaching the Gospel something that only a pastor was supposed to do? When did that become his job? Are you a Christian? Do you love Jesus? Does the Holy Spirit dwell in you? Do you have lips, and a tongue that can speak words? Do you have arms that can embrace, and feet that can walk with others? Guess what, you’re qualified for the job! If we’re “followers” of Jesus, then isn’t it time that we got off the pews and followed? Jesus said in the Great Commission, “Therefore GO and make disciples” (Matthew 28:19). Go where? Go to where the lost are. Go to where the agnostics and the atheists are. Go to where your friends and neighbors and coworkers are. He didn’t say, “Therefore wait for them to COME and hear the Gospel.” He also didn’t say, contrary to popular belief, to invite them to church. He didn’t say to wait until 10:30 Sunday morning for them to come to your church building. He said, “GO!” Why have we gotten this so backwards? “Preach the Gospel at all times, and if necessary, use words,” said Francis of Assisi (1181-1226). Preaching is not just something that comes from behind a pulpit and from a trained professional pastor; it comes as much, if not more so, from a believer’s body language and from his everyday relationships. Preaching of the Gospel must be a part of our very lives, no matter where we find ourselves from day to day. From where did we ever get this crazy notion that preaching the Gospel happens only for 20 or 30 minutes on a Sunday morning in some church building? Yes, something happens there, but personally I doubt very much that it’s preaching that occurs. What happens there is probably better called “encouragement,” but it’s not “preaching” in the sense that “preaching” has been understood by the early church. If it was the same, then where are the “daily” converts (Acts 2:47) like the early church experienced? Ok, lets settle for “weekly” converts; where are they? How about “monthly?” How many have been saved this past “year?” I rest my case. Do you see my point? “Preaching” has to do with proclaiming the Gospel of the Lord Jesus Christ, and the result of preaching is conversions to the Christian faith. I don’t know what the statistics are, or if there even are any statistics on this, but I suspect that the vast majority of true conversions to Christianity have always happened out in the world rather than in some church building somewhere. Have we become lethargic and content to simply “shuffle sheep” and call that church growth? Could it be that the reason our communities are not being saved is because we’ve somehow redefined what it means to preach of the Gospel? Could it be time for each of us to adopt the nickname “Preacher” and personally take the responsibility of proclaiming and preaching the Gospel of Jesus Christ? I wonder. Arrested for Displaying Christian Bumper Stickers? The light turned yellow just in front of him. He did the right thing by stopping at the crosswalk, even though he could have beaten the red light by speeding up through the intersection. He could have, but he didn’t. Meanwhile, the tailgating woman in the car behind him was furious as she honked her horn and screamed in frustration. Why? Simply because she missed her chance to get through the intersection, not to mention that she also dropped her cell phone and make up kit in the process. As she was still in mid-rant, she heard a tap on her window. Looking up, she found herself looking into the serious looking face of a police officer. The officer promptly ordered her out of the car and told her to keep her hands up and in plain view. She was taken to the police station where she suffered the humiliation of being searched, fingerprinted, photographed, and finally placed in a holding cell. After a couple of hours, another policeman approached her cell and, opening the door, escorted her back to the booking desk where the arresting officer was waiting with her personal effects. Aside from some minor editing on my part, so read the email I received recently. While at first I laughed and found it funny, I also found it equally sad when I thought it through some more. Why? I found it sad because it made me think of all the different ways that our actions and lifestyles do not line up with our faith professions. I'm sure the story is only fiction, but maybe there is more truth to it than meets the eye. Now, I’m not opposed to Christian bumper stickers in and of themselves. If you want to plaster them all over your car, then who am I to say that you shouldn’t? However, if you have even the remotest issues with anger or an ethically questionable lifestyle, then perhaps it would be wise to avoid any Christian-themed bumper stickers. Having them might just cause more harm than good to the cause of Christ. Besides, how does the world know that we are Christians? 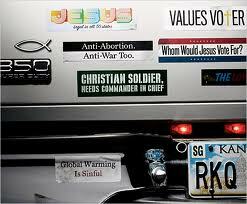 Does it recognize you and me as Christians by our bumper stickers? Sadly, and especially if our actions and lifestyles don’t line up with our faith professions, all that the world sees is hypocrisy! Is the world going to be impressed with a catchy-phrased and Christian-themed bumper sticker, or with a life that is filled with love, compassion, respect and gentleness? I suspect that if the world saw the latter in me, there would be no need for the former. Most people aren’t stupid. As someone once said, “they don't care about how much we know, until they know how much we care.” If our actions and lifestyles don’t line up with our faith professions, maybe we should be arrested ..... for false advertising. The Gospel According to Peter Pan? I was reading in Acts this morning which led me to comment on Twitter that, "I'm bothered by the fact that the Book of Acts is completely foreign to the modern church. We might as well be reading Peter Pan!" This comment resulted in someone answering back, "False eternal life; false conversion...sounds like a great metaphor!" I thought about that on and off throughout the day. Has the modern church as we know it bought into the Gospel of Peter Pan? 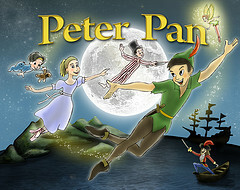 So, for those of you who strangely may not be aware of who Peter Pan was, let me begin by refreshing your memory a bit. 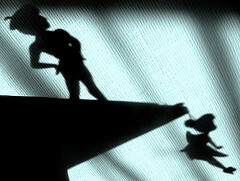 Peter Pan was the creation of J.M. Barrie (1860-1937). 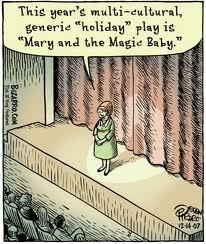 It's the magical story of a young boy who refuses to grow up. He lives on the island of Neverland with his gang, The Lost Boys. Peter's perpetual youthful life includes an assortment of adventures with mermaids, Indians, pirates and fairies. He is a careless and boastful boy who is often quick to point out to those around just how great he is. Peter has a "who cares" attitude and is surprisingly cocky when faced with danger. I would argue that Peter Pan is also a pompous and judgmental boy with a big attitude problem. When you stop to think about these things, it's amazing that parents even allowed their children to see the film. Children will emulate what they see in others, especially in heros and other popular characters. If their heros are cocky, boastful, judgemental etc., then they too are more likely to also become cocky, boastful, judgemental. It's the proverbial monkey see, monkey do. It is little wonder that so many young people have developmental issues. With all our talk of magic and fairies, it's almost like we've doomed them from the start. So what does all of this have to do with my reading of Acts this morning? What is all this talk about the modern church embraced the Gospel of Peter Pan? I think that, unfortunately, it has done just that. Before I share my thoughts, we should look at the Acts passage that led me to this conclusion. "They devoted themselves to the apostles' teaching and to the fellowship, to the breaking of bread and to prayer. Everyone was filled with awe, and many wonders and miraculous signs were done by the apostles. All the believers were together and had everything in common. Selling their possessions and goods, they gave to anyone as he had need. Every day they continued to meet together in the temple courts. They broke bread in their homes and ate together with glad and sincere hearts, praising God and enjoying the favor of all the people. And the Lord added to their number daily those who were being saved." I've often said, the Bible is either the Word of God, or it isn't. If we maintain that it is, and if we call ourselves Christians, then we have no excuse for not following its teachings and examples. If, on the other hand, we argue that it is not the Word of God, then our whole faith is a sham and we might as well all go book a flight to Neverland and join Peter Pan and the Lost Boys. In that case, we're obviously just as lost as they are. So which is it? Is it the Word of God, or isn't it? If you are reading this blog, I'm sure that you are not here because you believe in fairies, magic, and a tribe of Lost Boys who like to play with mermaids and fight Indians and pirates. I'm going to assume that you're here because you are interested in things pertaining to your faith. You're here because, like me, you search the web for other believers and (hopefully) some interesting, inspiring and encouraging truths. So let's get back to the text in Acts. "devoted themselves to the apostles teaching and to the fellowship, to the breaking of bread and to prayer." Where's the devotion today? If we are to assume that the dictionary definition of "devotion" is correct, then "devotion" means "a deep, steady affection: a feeling of loyalty; faithfulness." The early church may have had such a devotion, but I'm sorry, I just don't see the same thing in the modern church. "Everyone was filled with awe, and many wonders and miraculous signs were done by the apostles." Forgive me for sounding harsh, but do we even know what the word "awe" means any more? According to the dictionary, "awe" is described as, "wonder and reverence inspired by something sacred, mysterious or magnificent." Does that describe your normal church experience? If it does, I would suggest you're in the minority. "All the believers were together and had everything in common." Well, seems to me we blew that one too. A quick look at denominationalism proves that we certainly don't have everything in common theologically, and our materialistic hoarding tendencies proves we don't have a common pool of resources either! "Selling their possessions and goods, they gave to anyone as he had need." Do you see the modern church there? No, me neither. "Every day they continued to meet together in the temple courts." We sometimes get together with other believers two or three times per week, but "every day?" No, sorry. "They broke bread in their homes and ate together with glad and sincere hearts, praising God and enjoying the favor of all the people." Those of us who have left the traditional institutional forms of church life for the more organic and simple house church style, probably have a more successful time on this one. Still, most of us here too have a long way to go. "And the Lord added to their number daily those who were being saved." How many bonafide genuine conversions to Christianity do we see in our churches every day? How about per week? Per month? Last year? I thought so. We're great at shuffling the sheep, but not so great at turning goats into sheep. So if God in the Bible has preserved for us this passage of the fellowship of the early believers, does it not seem likely to you that He did so to set an example for us to emulate? Does it also not seem likely that it also serves as a barometer through which we can test and see whether or not we are on track with what He intended for the church? Likewise, if we find that we are not on the same page with the early church, and if we do nothing to seek to correct our error, is it not safe to say that we are then simply following a delusion of our own minds? If we have missed the boat of the seemingly simple truths of Christian fellowship, is it then not likely that we've also missed the boat on some of the deeper doctrines as well. If we cannot digest the milk, how can we digest the meat and potatoes? "False eternal life; false conversion." Is that true? Maybe he's got something there. If our preaching doesn't include the need for repentance, then it is a "false eternal life and a false conversion" we're experiencing. And that in turn may explain why the Book of Acts is completely foreign to the modern church; unlike them, we still need to learn to repent. Until we learn that, we'll never find our way back from Neverland. Until we learn that, we'll never be much more than cartoon characters in the Gospel According to Peter Pan.